Be the first to share your favorite memory, photo or story of Sally. This memorial page is dedicated for family, friends and future generations to celebrate the life of their loved one. 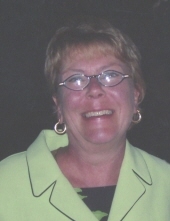 Sally A. Klein, 70, of Sheboygan, passed away Tuesday, March 26, 2019 at Sharon S. Richardson Community Hospice. Sally was born October 25, 1948, in Green Bay, to the late Marvin and Dorothy (Pautz) Hoppe. She graduated from Luxemburg High School and the University of Wisconsin – Oshkosh with a Bachelor’s Degree in education. She taught art at Kohler for 36 years before retiring 2006. In 1973 she married Michael Klein in Luxemburg. He preceded her in death in 2003. Sally enjoyed painting and was an avid fan of the Packers and Badgers. She also enjoyed spending time with her grandchildren. She is survived by her son, Eric (Tara) Klein, Buckeye, AZ; two granddaughters, Ella and Chloe Klein; one sister, Sandra (Ted) Nimmer, Gillett and one sister-in-law, Jeannine Klein. A memorial service will be held on Wednesday, June 5, 2019 at 5:00 PM at Ballhorn Chapels Funeral & Cremation Care Center, 1201 N. 8th St., Sheboygan. Relatives and friends may visit with the family on Wednesday, June 5, 2019 from 2:00 PM until the time of service at the FUNERAL HOME. In lieu of flowers, memorial donations can be made to Sharon S. Richardson Community Hospice. To send flowers or a remembrance gift to the family of Sally A. Klein, please visit our Tribute Store. Guaranteed delivery before Sally's visitation begins. Guaranteed delivery before Sally's memorial service begins. "Email Address" would like to share the life celebration of Sally A. Klein. Click on the "link" to go to share a favorite memory or leave a condolence message for the family.